I for one, found your long version a worth while read. I think that the movie can be enjoyed on its own merits and for its own sake. I enjoyed seeing the actors bring their characters from the printed page to life, so to speak. Sorry I'm just getting to this now, Jason. I think it's a terrific piece and I agree with it as much as I can, ethically, not having seen the film. Brian Wood twittered, I think, about that moment with the kerosene, and how horrified he was at the audience at his screening cheering it. It appears to have been the same kind of moment, for many people, as lions tearing apart Christian in the Colosseum. Ah, well: if this isn't a time for comfort in bread and circuses, what is? It is, perhaps, close-minded of me to say that this post confirms me in my desire not to see the film at all. Yeah, well, sue me. I was traumatized enough by Sin City, even while admiring the devoted capture of the comics' visual aesthetic. And thanks for the cite--gosh! I was covered with blushes when I read that! "The audience cheered when Rorshach killed the guy with hot oil. Really cheered. What's wrong with people?" I'm glad I wasn't the only one who thought that was upsetting. While I definitely enjoyed the movie to some degree, and it was nice to see the characters brought to life, like pfong says, I will acknowledge that it's not for everyone, and to me it didn't feel necessary. It's one person's version of the book, and that's fine, but it isn't definitive--thank goodness. I generally agree with your post--actually, I think you caught many of the flaws of the film pretty well. And as always, I really appreciate the thoughtfulness and character of your writing--your critique highlighted many an element that I missed when wat... viewing the movie. I did enjoy the film, although not near as much as I hoped I would. I really wanted to disagree with you on your review, but I can't. You're probably right about the excessive graphic violence of movie. I came about looking at it differently. I sort of felt that the graphic violence was put in to justify the R rating, which was necessary to show Dr. Manhattan properly detached. It became a sort of inside joke--letting the aggressive, early-twenties man in the audience tell himself the movie's rating was just for gore, not the chance to see a giant blue phallus. Of course, seeing the director's previous body of work, your explanation makes more sense. 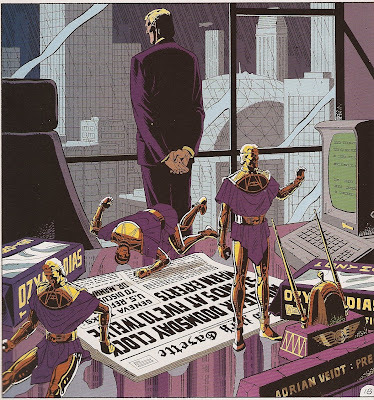 More substantively, I was most disappointed with the alterations to Rorschach's story. I've always loved Rorschach. (I disagree with your terming him a fascist--he never seemed able to work well enough with others to be a fascist, unlike, say, the Comedian.) I feel that the movie tried to make Rorschach into a standard Wolverine/Punisher anti-hero type, and it missed the most endearing aspects of his character. The difference between Rorschach hacking a criminal and Rorschach walking out with the place on fire is not as subtle as this movie wants to think it is, and I think you did a masterful job of the movie fails there. The movie also missed Rorschach's act of mercy for the young child, and it changed the nature of his sacrifice. It seems like R.'s line in the trailer, the "I'll look down and say, 'No,'" became the driving motive, rather than his inability to accept any moral ambiguity. Maybe a minor point, but to me that's what hurt the most. 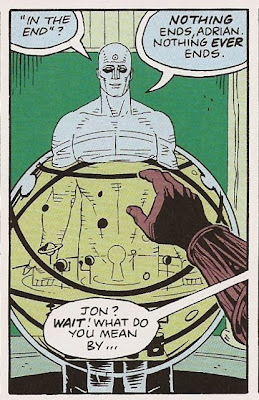 If you really wanted to stretch to find a moral, turning Watchmen--with its infinite shades of gray--into a standard superhero movie with easy black and white answers is perhaps an amazing act of satire. Probably not, but there must be a pony here somewhere! I do think the movie brought one benefit. If helped show the "masks" as much more detached--I felt a certain loneliness, and a distance between them the regular persons that I missed in the book. Now, this would be a tragedy if it was seen without the comic as a counter. 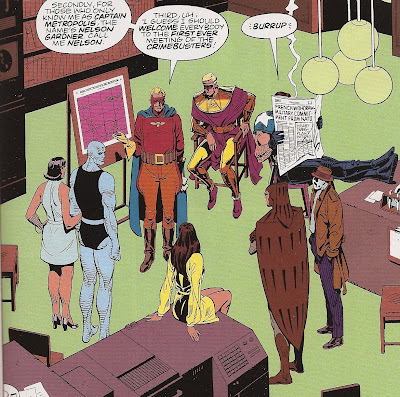 And perhaps it's another reason why the movie is less than impressive, because by taking out the vignettes of human interaction it makes Watchmen even more of a standard hero movie. 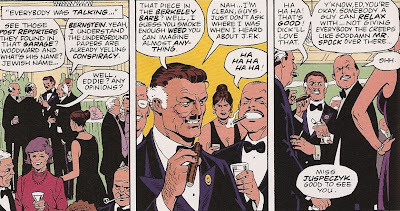 Still, the movie helped bring out several themes in the comic by serving as a nice contrast. Which shouldn't be the best thing one can say about it.